If you've made it this far, congratulations! We're in the home stretch, and by the end of the next post, you'll have found my Longitude, and have completed your first noon sun sight. I'm excited, so let's get right to it. In an earlier post, I said that if you could find the exact time of solar noon at your location, you could find your longitude. So the first step is to pull out your Noon Curve and find the exact time that solar noon occurred at my location. You could just eye-ball it, but you can get greater accuracy by swinging a few lines with a pair of dividers. I've used this trick before when lofting Cabin Boy. 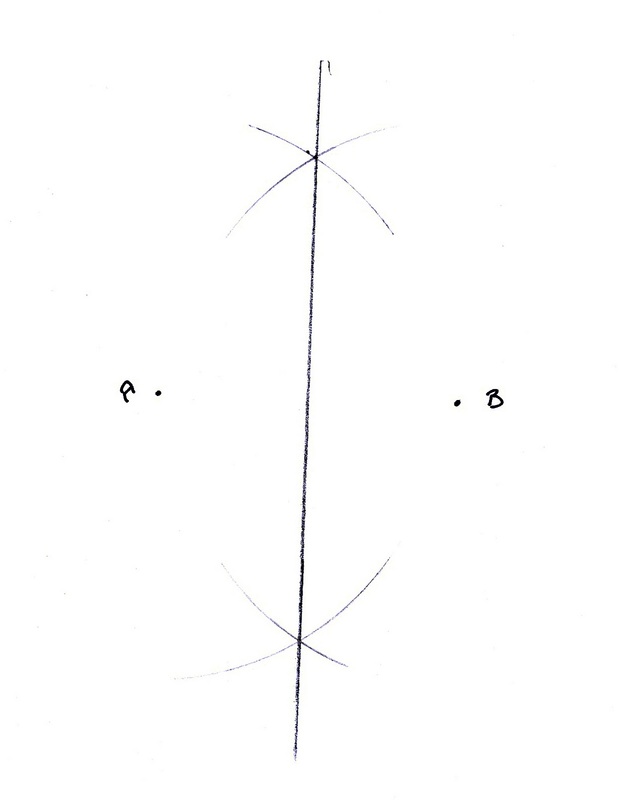 Suppose you want to find the midpoint between two points, A and B. Just take your dividers (I use my Weems & Plath navigation dividers), put the pointy end on point A and draw a curve above and below. Then do the same on point B. Then draw a line between the two intersecting curves. That's the trick. We will use this trick to find the middle of our Noon Curve at 3 places, and then average the times to find the exact time of Solar Noon. Again, this is something you want to actually do, not just read about, so pull out your Noon curve. 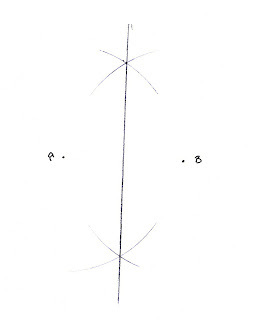 Pick a spot near the top of the curve, like the point 'A' on my curve, above (click drawing for larger view.) 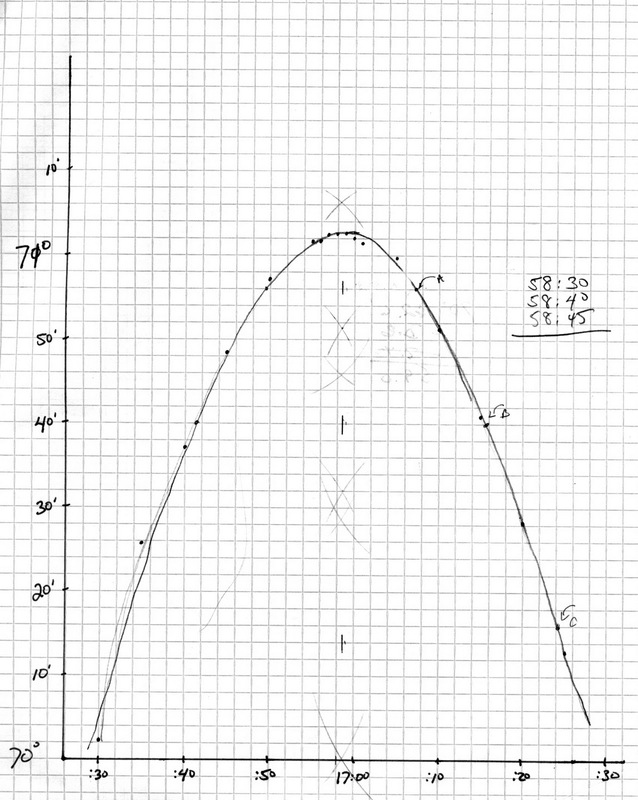 The point should be both on the curve, and on one of the horizontal lines of the graph paper. Put the pointy end of your dividers on that point, and swing two curves, one above and one below. 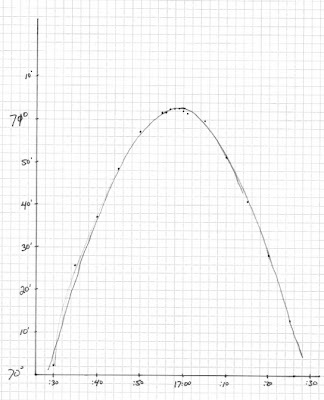 Then find the point on the curve just opposite, by following the horizontal graph line over to the curve, and draw the two curves from that point. 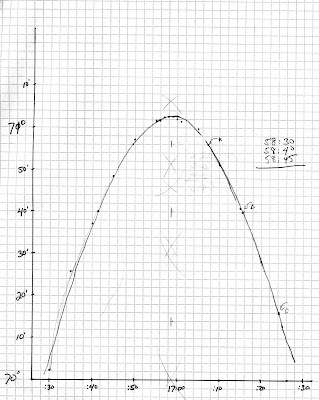 Then line up a ruler with the two intersecting curves and draw the midpoint. 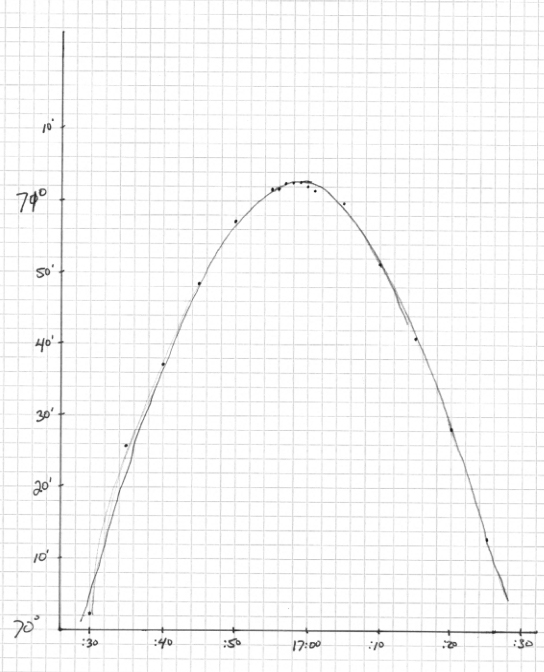 I just draw a short segment between the two points, to keep the graph from getting too cluttered. Then do the same with two other points in the middle and towards the bottom of the graph. Once you've got your 3 midpoints, estimate the corresponding times as closely as possible. Your curve will be different than mine, so your times will be different. That's okay. Use the times you found. If you add them and then divide by 3, you get the mean time: 16:58:38. This was the exact time of solar noon at my location... at least according to my sights, my ability to draw a smooth curve, and my ability to estimate the three times from a small graph. This is not a GPS... human skill and error play a significant part in celestial navigation. Never forget! Now that we have the exact time of solar noon (the 'exact time' you found from your graph will probably be different, but within 30 seconds, hopefully! ), we can use that to find Longitude. How we do that is pretty interesting, and that's what we'll tackle, next time! Speaking of next time... if you'd like to be notified when I post a new 'lesson' (erratically, about 3 times a week), you can sign up for my super-sophisticated Automatic Notification Process. Actually, it's just an email, but Automatic Notification Process sounds better. I won't spam you, and you can de-sign up at any time. In my spare time, while waiting for "Hello World" to appear, I've built an accurate replica of H1 using only tin snips and a rat-tail file. Whoops, you are right. I decided it was too much to cover in one blog post, so split it up. Sorry... I was thinking of an earlier Harrison clock that had a wooden movement and is still operational. H1 was a metal clock, of course.